African Beat – Hear the History! 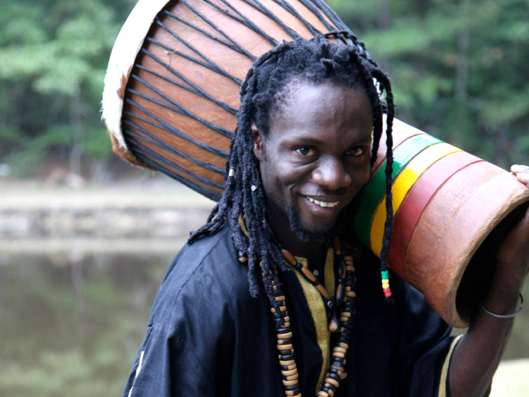 Students will sing in Wolof, clap various rhythms, and experience West African drumming with Senegalese musician, Diali Cissokho. Diali will perform on the kora, an African harp, and will engage students on the djembe, accompanied by Hilary Cissokho on various percussion instruments. By the end of this participatory performance, students will have learned about West African culture, music, and its relation to history. Perfect for Black History Month, multicultural celebrations, and assemblies for character education. Students will learn several West African rhythms and basic percussion technique as they play the djembe and sing call and response style songs in several African languages. They will be introduced to the African aural history tradition and the cultural significance of drumming in African society. Students will develop trust, listening skills, focus, and a sense of pride in their cooperative accomplishments, while having a lot of fun in this high-energy musical experience! A culminating performance can be incorporated if desired. Special Requirements (Space, Tech, Volunteer): Space large enough to accommodate a circle of chairs for student drummers and instructors. Residency Fee: $125.00 per class/hr.